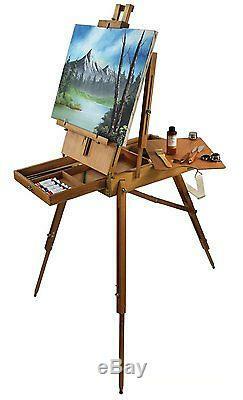 Hardwood French Easel All Medium Art Supply Set. 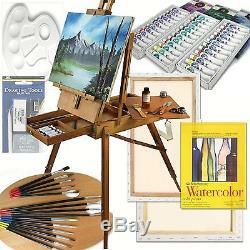 Artist Quality Paints, Canvases, Books, Brush Sets and Much More. OUR FRENCH EASEL IS HARDWOOD, ARTIST QUALITY, AND FULLY ASSEMBLED. This is a fully adjustable field, table, and studio easel with storage unit all in one! Constructed of hand-sanded european beechwood and brass hardware, it features a sliding drawer with divided compartments, a removable wooden palette, adjustable shoulder strap and a durable leather handle. Extends to a full height of 71 and accommodates canvases up to 34 inches in height. 18 COLORS OF OIL, ACRYLIC & WATERCOLOR IN PAINT TUBES BY ART ADVANTAGE (2 Each of 18PC Sets) 108 TUBES! IN RETAIL SETS Art Advantage paint sets offer good lightfastness and covering power. 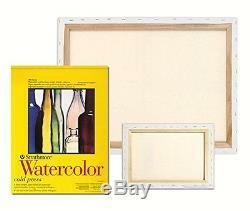 Watercolor: Good transparency permits the white reflective surface of watercolor paper to shine through. Oil & Acrylic sets manufactured using only quality pigments. Oil Sets feature: High level of pigmentation. 24 LOUVRE OIL PASTELS in Retail Set by Lefranc & Bourgeois. 6 REAL PRE-STRETCHED BLANK (PRIMED) ARTIST CANVASES. (2) 16"x20" (2) 11"x14" (2) 8"x10" (Shrink-Wrapped) 11oz (Primed) Pure Cotton Duct Canvas 5/8 Profile Depth, Gallery Wrap (Staples on Back) Ready to Hang Medium Texture Acid Free Triple Primed For Oil Or Acrylic Paint. 3 CANVAS PANELS included (recommended for Pastels) 5"x7", 8"x10", 11"x14". 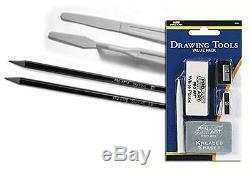 STRATHMORE 300 SERIES WATERCOLOR PAINTING PAD. 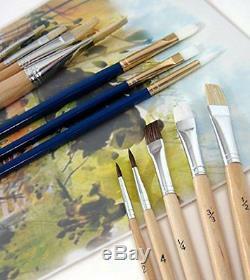 CONNOISSEUR PROTEGE ARTISTS BRUSH SETS, 2 Long Handle, and 2 Short Handle Artist Quality Brushes (a 60.00 Value). 2 NEW BOOKS:'The Art of Oil Painting' 144 Pages (Walter Foster) Provides inspiration and instruction on every aspect of oil painting. Our French Style Easel is ideal for use either indoors or outdoors. 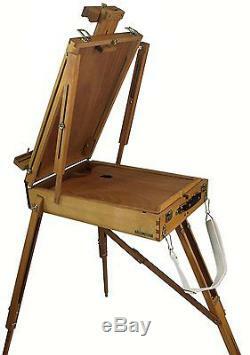 For outdoors as a field easel for the working artist, meant to be portable and for the creation of en plein air work with adjustable telescoping legs based on the tripod design, a drawer in which to store art supplies conveniently, along with a handle and strap for easy transport. Handcrafted and Hand Varnished hard beech wood. Easel is finely crafted using real'Dove-Tail' joints. Brass hardware, Lightweight with leather handle, Very Portable. 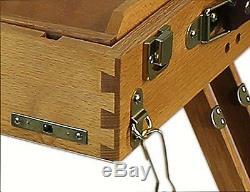 Pull Out Drawer with latch, for storage of supplies, paints and brushes. Adjustable telescoping legs Adjusts to numerous configurations Versatile - Folds down to be a tabletop box easel. This is Solid Artist Quality Product made to last for decades. If you don't find this easel rivals models from France and Italy.. The item "Hardwood French Art Easel Set Special Edition Artist Quality Painting Supplies" is in sale since Saturday, April 30, 2016. 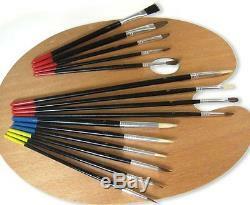 This item is in the category "Crafts\Art Supplies\Easels". The seller is "fantasticfactoryfindsfromusa" and is located in Red Oak, Texas. This item can be shipped to United States, to Canada, to United Kingdom, DK, RO, SK, BG, CZ, FI, HU, LV, LT, MT, EE, to Australia, GR, PT, CY, SI, to Japan, to China, SE, KR, ID, to Taiwan, TH, to Belgium, to France, to Hong Kong, to Ireland, to Netherlands, PL, to Spain, to Italy, to Germany, to Austria, RU, IL, to New Zealand, PH, SG, to Switzerland, NO, SA, UA, AE, QA, KW, BH, HR, MY, BR, CL, CO, CR, PA, TT, GT, HN, JM.